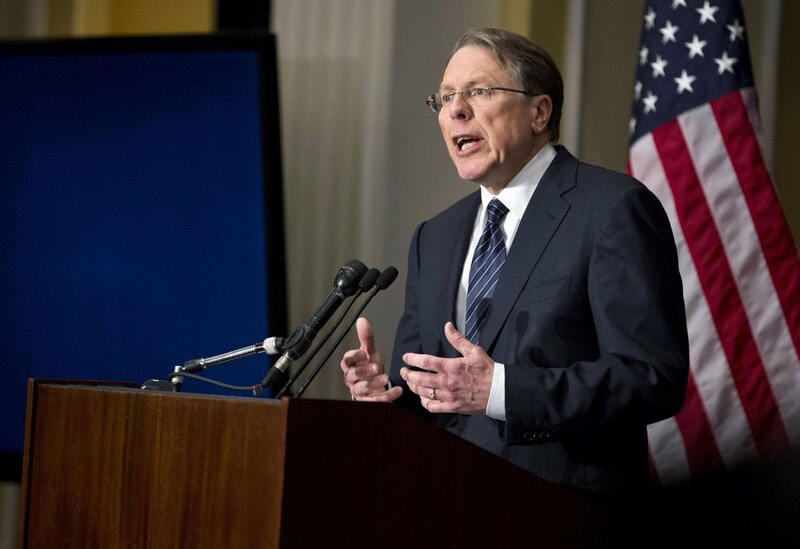 I was disturbed by much of what Wayne LaPierre, NRA Executive Director, said this morning in a response to the Newtown shooting. His speech was nothing less than combative and defensive. With the best eloquence that money can buy, LaPierre launched his argument in defense of the ethical legitimacy of lethal weapons. In stereotypical fashion, he placed blame on video games and the media, refusing to accept any responsibility for the deaths of children through the perpetuation of a system where the capacity to take life is publicly accessible. It is my prayer that LaPierre's statement will expose the absurd notion that it is somehow "peaceable" for people to arm-up in preparation for lethal violence through the accumulation of firearms. 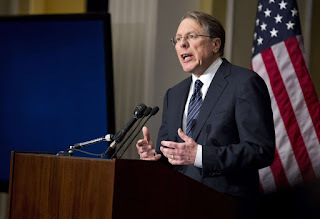 All that aside, nothing was more disturbing that this: LaPierre said, "...when you hear the glass breaking in your living room at 3 a.m. and call 911, you won't be able to pray hard enough for a gun in the hands of a good guy to get there fast enough to protect you..."
With this short example, LaPierre brings the conversation down to a foundational level--the level of prayer and theism. Now, I'm sure that many American Christians will agree with this statement, but that does not preclude the fact that such a theology of prayer is fundamentally un-Christian. By saying, "you won't be able to pray hard enough for a gun," first of all, he's making a pretty unfair assumption. Just because his first reaction will be to hope for the powers of coercive violence to come to the rescue, does not mean that the rest of us will, especially those of us who have been training ourselves to love our enemies and pray for those who persecute us. Secondly, and more importantly, the god behind such a prayer, the prayer that calls for the powers of death to come to the rescue, is not the God of life revealed in Jesus Christ. What LaPierre said exposes his theism, what I think is fairly representative of American theism, as distinctly different from Christian theism. Christian prayer will always be prayer to a crucified God--a God who achieves victory and resurrection by way of God's own public execution--not through the powers of death but through the conquest of death through embodied love in martyrdom. Therefore, any prayer which appeals to the powers of death, any prayer for a gun in the hands of anyone, is not Christian prayer. Christian theism, because it sees resurrection as its future, stands in contradiction to any theism which has as its object the coercive force of lethal violence. American theism images God through the lens of its own preservation. "God bless America" has been used as an image of American spiritual and moral superiority. As long as we print "God" on our money and pray in our schools, we think, we'll be protected to pursue our own ends. It's a theology of "good" vs. "evil"-- "good guys" vs. "bad guys"--and thus we justify violence through pitting one against another. Christian theology declares, "only God is good" and it inaugurates the end, through means of love and martyrdom, of all of the patterns of sin and death. Christian theology has no "good guys" or "bad guys" and thus it justifies no violence of one against another. It operates on the conviction that all are "depraved" and that evil is essentially universal, thus judgement belongs only to God. American theism lays the foundation for a society in which each person bears the capacity to take the life of another, under the right circumstances. Christian theism, because of Christ's death on the cross and Christ's subsequent solidarity with all who experience violence, cannot envision a circumstance in which one should take the life of another. Whatever history one might like to appeal, the cross and the resurrection of Christ is the church's corrective lens. When the glass breaks, as LaPierre imaged for us, while American theism prays for the power of death to be its savior, Christian prayer appeals to love and longs to hope for something better than a gun in the hands of a "good guy," it longs for the resurrection of a good God who shares the fate and identity of a broken humanity.